At the beginning of May, a report by TheInvestor revealed that the sales of Samsung’s S9 and S9+ are at a record low in the home country, Korea. In a few months, the company is going to launch the Galaxy Note 9 (Expected launch in August). There haven’t been a lot of leaks of the device in the past, but it is already confirmed that Samsung is testing the phone. Today, the Samsung Galaxy Note 9 showed up on Geekbench with similar scores as the S9 and S9+, since the chipset isn’t going to change at all. The Geekbench listing shows the model number SM-N960N and the device is running on Android 8.1.0 Oreo right out of the box. There is 6GB RAM, and the Exynos 9810 chipset powers the variant listed on Geekbench. 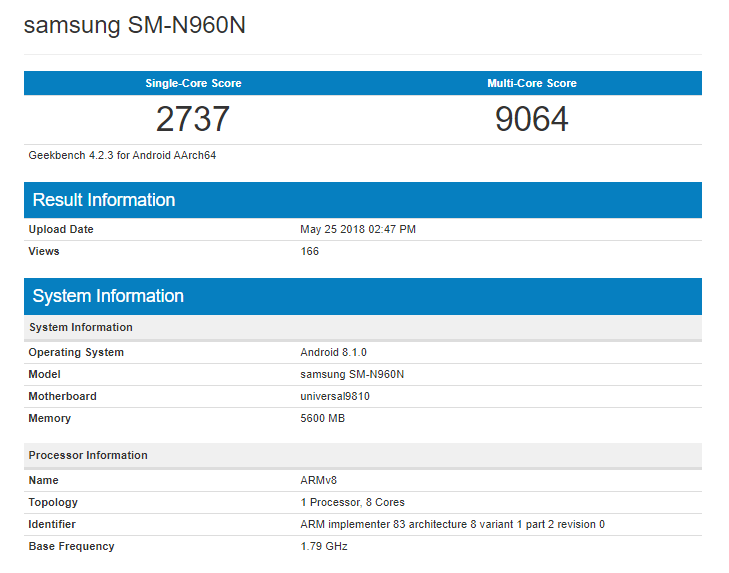 Talking about the Geekbench scores, the Samsung Galaxy Note 9 scores 2737 on the single core and 9064 on multi-core. It is worth mentioning that the Galaxy S9 and S9+with Exynos 9810 chipset score 3K+ on the single core but the score remains less than 9K (between 8400-8700) on multi-core. We know that the Exynos 9810 is a bit better than the Snapdragon 845 when it comes to the benchmark scores. So, we expect the Snapdragon 845 variant of the Samsung Galaxy Note 9 to have lesser scores than the Exynos 9810 on Ggeekbench. The phone is still under testing, so it will be better not to expect a lot at the moment, just by looking at the benchmark scores.